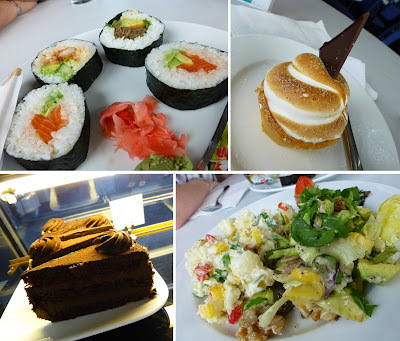 I started writing a blog post a month or two ago…it was going to mostly be about food…you know, things I’ve eaten since I’ve been in Melbourne…you’d love it I’m sure. But my enthusiasm comes in waves, and it currently hasn't progressed quite as far as you’d hope after this period of time. So I thought that, at least for now, I would write a whole new post about something that has nothing to do with Australia. And also not a lot about food. It’s this wonderful little thing called Christmas Wonderland. I find it very hard to explain…specifically because it is an indoor trail of decorated artificial Christmas trees. Each year, when the time comes to start installing the tired tree and re-used decorations, I become very excited and work incredibly hard for what ends up being a truly mediocre looking plastic plant. But somehow, when you get 150 of these trees, along with a few incredibly talented ladies and a whole bunch of volunteers, the result is really quite mind-blowing. Here are a few photos to get you in the mood…but please understand that these really don’t do it any kind of justice. Visit www.christmaswonderland.org.nz/ for all the info, including ticket prices. This is a community event, with practically every worker you lay eyes on being a volunteer, and with all proceeds going to the Rawene Centre to aid in the continual work happening there each week. Let me know if you go, and what you think!